Rundeck is a very handy tool when it comes to runbook automation. Many organizations use rundeck as a job scheduler and to automate daily tasks. Similarly we used rundeck for our release and deployment activities. 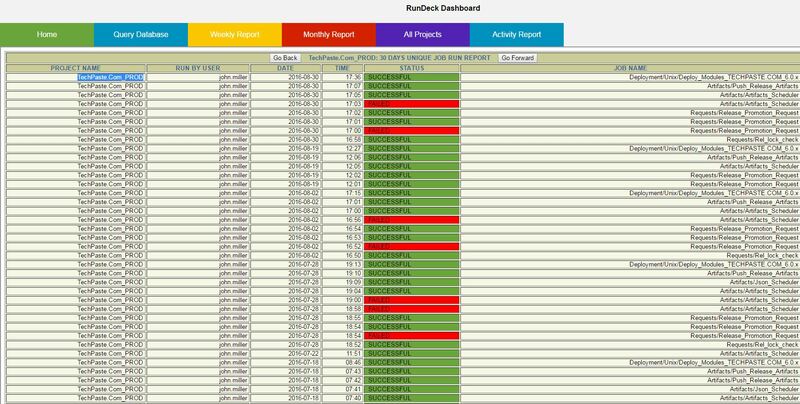 In Rundeck we had almost 30+ projects with different jobs(Though similar names for deployment jobs) running and our management wanted to know status of all jobs in a weekly and monthly report with a custom Rundeck dashboard to view daily job runs across all projects. Rundeck currently does not have a consolidated reporting dashboard for all projects which can be shared/emailed automatically weekly and monthly. It is also very hard to go to individual projects and get the individual job runs status and format and send manually to management. So to avoid this we created a simple Rundeck dashboard for reporting named “Rundeck Reporting Dashboard” which displays all job run for individual projects active in Rundeck, Weekly and Monthly deployment/release job run report for individual projects, All activities count report per project,etc. 1. Rundeck already installed and all services working fine. a. Rundeck installed in /opt/rundeck and is on a linux server. c. Apache webserver is installed and available for use with directory listing module. e. /opt/scripts/status folder has been mapped to Apache as a documentroot directory so that you can access the folders contents via web browser. 4. All the deployment jobs in all projects are under Deploy_Modules group. If you have something different then you have to update the same in the report generation script. 1. Report for Weekly Job runs status accross all projects. 2. Report for Monthly Job runs status accross all projets. 3. Report for detailed job runs for individual projects in one place. 4. Automatic email of Weekly Job Runs status reports and Monthly Job Run Status reports to email groups. 1. This is a dirty way of getting things done but works for my scenario till the point we get any descent plugins to do the same from backend and make things better. 2. This is made outof shell script and it runs through the rundeck execution logs to get the results and generate the html reports. 3. We assume that you have good command on linux and shell scripting to understand this article and script functionalities. 4. Simple copy paste of script might not work for you and some modifications might be required to make it working on your environment and directory structure. 1. Copy the below content into a file named index.htm and place the file at /opt/scripts/status folder whcih is the documentroot folder also in apache config file. // .onload doesn't work with IE8 and older. Sample Output of Dashboard frontend. You can add more tabs if required. 2. Copy the below content into a file named status.sh and place the file at /opt/scripts/status folder which is the documentroot folder also in apache config file. 1. clean_reports : Clear’s old html reports before generating new ones. 2. 7days_release : Generates 7 days of deployment job run report which matches Deploy_Modules* as group name. 3. 30days_release: Generates 30 days of deployment job run report which matches Deploy_Modules* as group name. 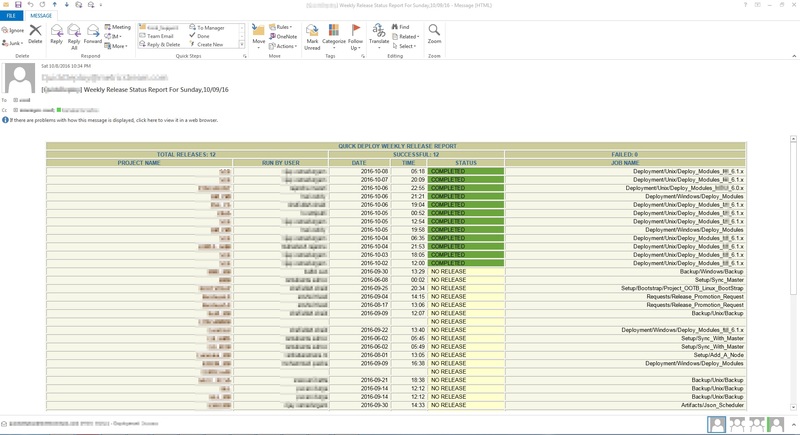 4. all_projects : Generates the base report with links to individual project wise job run reports. 5. email_admin : Generates and sends email templates reports for sending via email using cron jobs. # To get individual Projects Status. [[ $SOURCE != /* ]] && SOURCE="$DIR/$SOURCE"
#echo "`date` :Script Run Directory set to: $DIR"
#echo "Found count = 0"
#echo "Count For $_line : $_count"
echo "Did not find anything." 3. cd to /opt/scripts/status folder and run the status.sh file after providing the execute privileges. This will generate all the html reports like below including all projects individual job run reports. 4. Once all above reports are generated you can use the dashboard to access the individual reports via web browser as shown in the demo screenshots in the starting of the post. You can schedule the script to generate the reports each day and send emails about job runs daily,weekly and monthly. This concludes the custom rundeck reporting dashboard creation. Excellent work :@TECHPASTE TEAM. very useful. I have doubt on this line of code. what is this line of code exactly doing ? reason, am getting only 2_jobrun.html file generated but 7DaysRelease.html file is empty.